I've been looking back over my trades of the last few months and noticed an interesting phenomenon. I'm doing more Outside In trades than Inside Out. Why? Seems that the way that the markets are moving gives a better edge fading the moves than trading the pullbacks. I think we are seeing the effects of the lower volumes as traders are staying away from the markets. I noticed a post in the Zero Hedge blog talking about how the viewership (is that a word) of the financial channels are dropping dramatically. I think that's partly because of less interest in the markets but also because people are finding better and more easily accessible information on the Web. The reason that the Outside In trades are working "better" must be because moves are exaggerated and it's a matter of doing what I did on the floor: coming in and providing supply. The pic below is an example. I start with 25% of my position and double and triple down as the trade goes against me. 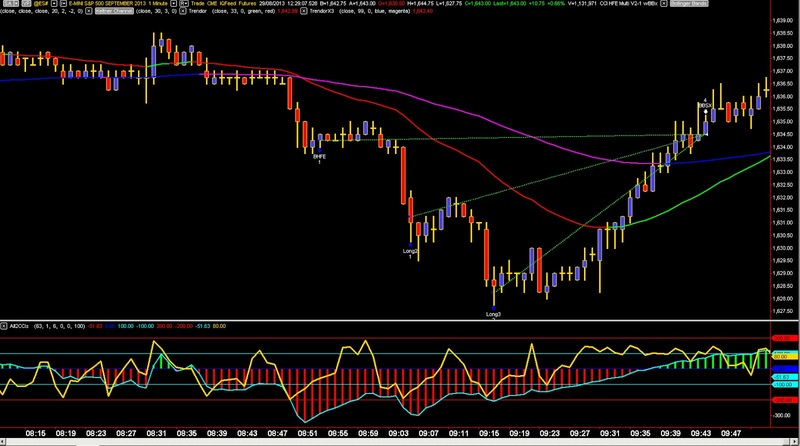 This trade management is important to maximize the profitability and reduce the stress of this trade. I see you are taking trades on each standard deviation and exiting at the VWAP. 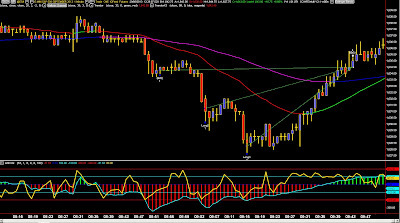 Can you comment on how you use the VWAP bands with the EMA's? Anon 0:44, Definitely not using the VWAP. It's purely identifying the overbought and oversold. VWAP could be used but isn't so accurate on the longer periodicities and more "ddesigned" bar types like the LURenko. See the next post after this one. Interesting that you're taking the longs there. From my (very limited) training so far I'm seeing a confirmed downtrend and a couple of nice slings along the way to get set on the short side. Ross, there are 2 sides to the story - inside out trades in the direction of the trend and outside in trades fading the trend from an overbought and oversold position. Trades can be taken in just one mode or in both modes. Putting that all into an algo means that you can turn different modes on and off while hybrid trading.